The Originals® line for pre-walkers is designed to most closely mimic barefoot walking and the natural foot shape of a child. The Grip n Go® line is the perfect line to help toddlers transition from early walking to walking with a more confident stride. The Flex® line combines everything she wanted for her daughters when looking for a rubber soled shoe; high quality, fine leather and a soft flexible rubber sole. They also have a new Adventure Line! The Adventure Line is an innovative collection of eco-friendly, machine washable, water-safe shoes. -Soft, Cushioned Leather Soles - Made with a double layer of leather plus a foam pad on the soles for extra cushioning, pediped® footwear provide infants with the ultimate in comfort and protection. -Velcro Fasteners - pediped® footwear feature velcro fasteners that make them quick and easy to put on (even with just one hand). And they stay securely on babies’ feet. -Indoor/Outdoor Use - pediped® footwear provide the benefits of a true soft-sole, yet are ideal for both indoor and outdoor use. I have always been a huge fan of pediped shoes! I love their mission to create safe and comfortable shoes for our little ones and I love how cute all their shoes are! I am so excited to have found a super cute but yet comfortable pair of sandals for my son for the summer! Just seeing them made me so ready to get him in them and go on walks again! 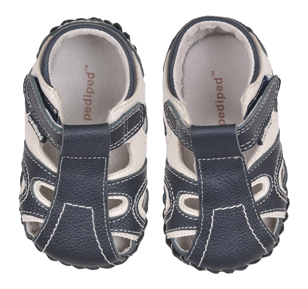 In these cute sandals, his feet won't get all sweaty but will stay cool while he plays! I love how soft the leather is and I just know he won't want to take these shoes off once I get them on! I recommend pediped shoes for all children! They are designed to be very comfortable are made especially for young walkers and to help foot development! Above all that, they are EXTREMELY cute and will definitely keep your child lookin' fashionable! Buy It: You can purchase the Brady sandals for $32 on the pediped website. 1) This giveaway will end March 16, 2011 at 12:00 P.M. (noon) central time. 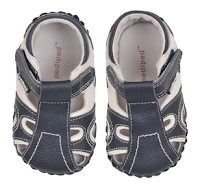 4) Go to the pediped website and tell me a pair of shoes you would love to have! 7) Grab my NEW blog button and post it on your blog - let me know you did and the link to your blog in a comment. Winners will be chosen randomly by Random.org, contacted by email and pediped will send your prize by mail. My little boy will be here in a few weeks or so and I already have one pair of Pediped shoes but another would be great! I'm a follower of both. My Li GUy Jayden Would Love A pAir Of These he is currenlty 8 months!!! My favorite style shoe is the Gisele! Giselle-Choco Brown pair, oh sooooooo adorable! AH! It's Kismet! I would love the Brody for MY Brody! Perfect :) thanks! Voted for you on TBB! thanks! Voted for you on We're on the fence! thanks! Entered be Present pants giveaway! I'm a follower via GFC. I 'like' Pepiped on Facebook. I 'like' The Review Stew on Facebook. The Isabella - Chocolate Brown are adorable! I like Pediped on Facebook (Erika B) & I already follow you via GFC. Thanks! I like the Jimmy shoes in Navy!